Habeas is working. The judges of the U.S. District Court for the District of Columbia have ably responded to the Supreme Court’s call to review the detention of individuals at Guantánamo Bay, Cuba. As former federal judges, many of us expressed our confidence as amici in Boumediene v. Bush that courts are competent to resolve these cases. We write now to affirm that our confidence has been vindicated. While we take no position on particular cases, a review of the District Court’s treatment of the Guantánamo litigation convinces us that the court has effectively developed a consistent, coherent, and stable jurisprudence. The government began to detain individuals at Guantánamo in January 2002. After a series of storied decisions culminating in Boumediene v. Bush, the Supreme Court charged the judges of the District Court with developing the framework for reviewing the habeas cases of individuals detained at Guantánamo in order to determine whether their detentions are lawful. Some commentators, including some judges and legislators, have suggested that the courts are struggling to take on an essentially legislative project, and that the courts are in desperate need of further instruction from Congress. On the contrary, courts are well suited to meet this challenge. Their competence in developing evidentiary and procedural rules comes from hard-won experience. District Court judges are on the front lines, applying the law to complex facts and balancing the competing needs of litigants. Because of their institutional competence, courts have historically developed rules of procedure and evidence. This was true under the common law, and is true of the Federal Rules. In their “time-honored and constitutionally mandated roles of reviewing and resolving [habeas] claims,” courts are also uniquely competent to determine the lawfulness of a prisoner’s detention. In Guantánamo cases, courts make this determination by assessing whether the detention standard advanced by the government comports with the law, and then applying the standard to the particular facts of the case presented by a prisoner’s habeas petition. Assessing the law, and applying it to facts. This is the core of what courts do. This is judging. It comes as no surprise, then, that the District Court has capably answered the Supreme Court’s charge. The bench has moved judiciously and cautiously to apply the pertinent law and develop the procedural rules governing habeas cases. In that way, the courts have gradually forged an effective jurisprudence that seeks to address the government’s interest in national security while protecting the right of prisoners to fairly challenge their detention. In Boumediene v. Bush, on remand from the Supreme Court, Judge Richard Leon adopted the detention standard used by the Department of Defense in Combatant Status Review Tribunals and endorsed by Congress. When the Obama Administration took office, the government modified the proposed detention standard based on the authority conferred by the Authorization for the Use of Military Forces (AUMF). Judge Reggie Walton adopted the new detention standard in Gherebi v. Obama, under which the government claimed the right to detain individuals who “planned, authorized, committed, or aided” in the attacks of 9/11, or who “were part of, or substantially supported” the Taliban, al Qaeda, or associated forces. The Administration conceded that its detention authority must comport with the Constitution and the law of war. Judge Walton found the government’s standard met those requirements so long as “the terms ‘substantially supported’ and ‘part of’ are interpreted to encompass only individuals who were members of the enemy organization’s armed forces.” In accordance with the principles of the common law, Judge Walton recognized that the contours of the standard would be developed as the standard was applied to the facts on a case-by-case basis. Subsequently, other judges of the District Court adopted and applied this standard. In Al-Bihani v. Obama, involving an acknowledged member of a Taliban brigade, the U.S. Court of Appeals for the District of Columbia Circuit returned to the detention standard originally offered by the Bush Administration. The court also rejected the law of war as a constraint on the government’s detention authority, contrary to the view of the Supreme Court in Hamdi and both the Bush and Obama Administrations. While we express no view on the D.C. Circuit’s substantive opinion, we agree that the work of the U.S. District Court for the District of Columbia demonstrates that courts are competent to move carefully and incrementally in the application and refinement of a substantive detention standard. In the process, they have produced a body of law that provides a predictive framework for litigants and useful guidance for the government and intelligence agencies in the current military campaigns. The District Court has also developed effective rules of evidence and procedure that seek to balance the government’s interest in protecting national security against the detainee’s interest in his liberty. Shortly after the decision in Boumediene, Judge Thomas Hogan drafted a Case Management Order (CMO) to govern the Guantánamo litigation. The result is a cautious and coherent set of procedural and evidentiary rules. The CMO established a model for the District Court, which has now applied the CMO to numerous cases, creating a common law interpreting its provisions. The government and detainees at Guantánamo look to these interpretations for guidance. What is more, the rules provide the essential flexibility required for addressing the new and complex factual scenarios presented by Guantánamo cases. Boumediene established that prisoners at Guantánamo have a right to mount a meaningful challenge to their detention. The CMO protects that right by giving prisoners access to three categories of evidence: 1) exculpatory evidence; 2) evidence relied on by the government to justify its detention; and 3) additional evidence if and only if the detainee can show good cause. For the first category, the CMO directs the government to disclose to the petitioner “all reasonably available evidence in its possession that tends materially to undermine the information presented to support the government’s justification for detaining the petitioner.” Over a series of cases, the District Court has settled on the interpretation that “reasonably available” means information in one of three databases compiled by the government. The District Court judges have also arrived at uniform interpretations of what evidence “tends materially to undermine” the government’s case. They agree, for instance, that it includes evidence that a witness was subjected to “abusive treatment [or] torture." The second category, evidence on which the government relies, includes “(1) any documents and objects in the government’s possession that the government relies on to justify detention; (2) all statements, in whatever form, made or adopted by the petitioner that the government relies on to justify detention; and (3) information about the circumstances in which such statements of the petitioner were made or adopted.” The District Court judges interpret this language narrowly, and defer to assertions by the government that it did not rely on information requested by a detainee. Under the CMO, disclosure of exculpatory evidence and evidence upon which the government relies is automatic. Disclosure of any additional evidence, however, requires a showing of good cause by the detainee. Such requests must be narrow and specific, must explain why the requested evidence is likely to show the prisoner’s detention is unlawful, and must establish why production will not “unfairly disrupt  or unduly burden  the government." The court is quick to reject broad requests and “fishing expeditions,” but has granted narrow and specific requests, such as requests for medical records and evidence of torture. Beyond discovery, the courts have developed a host of procedural and evidentiary rules to assist in the orderly and judicious resolution of these cases, which evolve with experience. Foremost, the court has imposed a strict set of procedures that guard against the misuse or disclosure of classified evidence. On the merits, the courts have held the government must establish its case by a preponderance of the evidence—the standard proposed by the government. The government generally enjoys a rebuttable presumption that its evidence is authentic, but not that its evidence is accurate. Hearsay is admissible, with the weight given to a particular piece of hearsay determined by the court based on the entire record. Similarly, statements procured by torture or undue coercion are generally accorded no weight. The court designed these rules in an effort to avoid unduly burdening the government or compromising security, while still requiring it to justify the individual’s detention. 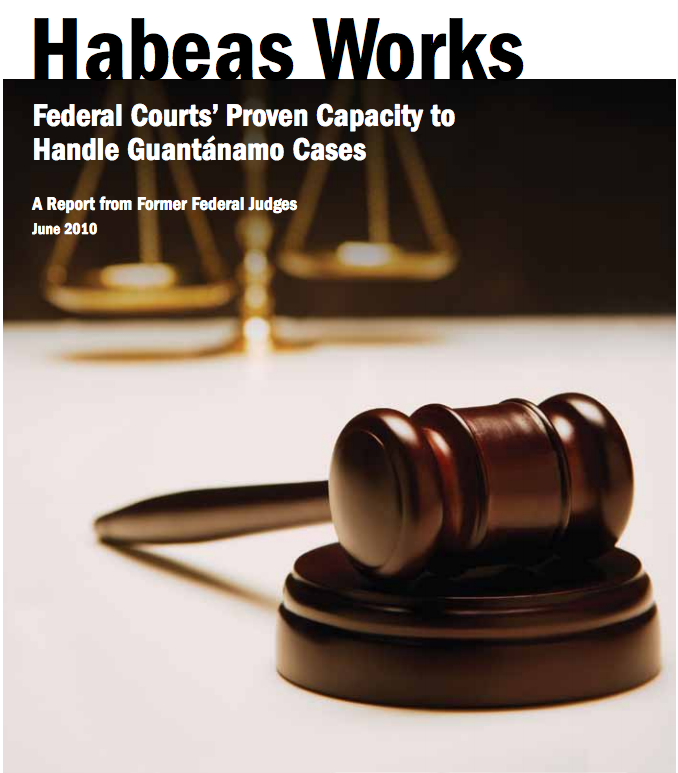 Although the District Court has granted the writ of habeas corpus to 36 of the 50 individuals whose cases have reached final decisions, the raw numbers do not tell the whole story. One case in which the writ was granted involved 17 Uighurs, whom the government had already conceded were “no longer” enemy combatants and had agreed posed no threat to the United States. Controlling for these 17 individuals, the government has prevailed in more than 40% of the habeas petitions that it has actually contested. Of the habeas cases that have reached resolution in the District Court, 18 appeals are pending, 12 by detainees and six by the United States. One of the cases on appeal, Al Bihani v. Obama, was affirmed, but the appellants are seeking en banc review. Thus, a careful study of the D.C. federal courts’ post-Boumediene jurisprudence shows that attacks on the judiciary’s role are entirely unfounded. We fully recognize that Congress has the power, within constitutional limits, to set a detention standard of its own, and to prescribe rules of evidence and procedure to govern habeas cases. But in our considered judgment, reflecting our many years of experience on the bench, and based on our study of the available data, there is no need for Congress to do so here. Moreover, even if Congress were to legislate new standards, the courts will still have to interpret and apply the new law. Asking Congress to legislate an entirely new set of substantive or procedural rules to govern these cases would simply destabilize the emerging jurisprudence.